Betcha can't eat just one of these Italian Sausage Stuffed Mushrooms! This delicious party appetizer is wildly addictive and gloriously gluten-free too. Pre-heat oven or toaster oven to 350 degrees F.
Clean mushrooms, remove stems, and arrange on an oiled baking sheet. Bring a small pot with 3/4 cup of broth or water to boil. Add quinoa and cook, partially covered for 12-13 minutes until fluffy. While the quinoa cooks, bring a skillet to medium-high heat. Remove casings from sausage and add to your skillet. Cook sausage, stirring often to create small crumbles, and once it's no longer pink in the center, set aside. The goal is to leave the sausage a bit juicy since it still has some oven time ahead of it. Keep burner on and, using the same skillet, add your onion and a little bit of water [or broth... or wine!] to deglaze the pan and saute. When onions start to soften, add in garlic and chopped mushroom and reduce heat to medium. Stirring occasionally, cook until onions are tender and translucent. Add your quinoa to the sausage mixture mix thoroughly. Season with sea salt, garlic powder, and paprika. I like these garlicky [and wouldn't have them any other way!] so feel free to give the mixture a taste before adding the garlic powder. If you love it as is, have at it. If you're a garlic lover, add the 2 TBSP in full. Let your taste buds be your guide! Remove from heat and allow to cool just a tad before handling. Refrain from scarfing too many spoonfuls of the stuffing in your mouth while you spoon the mixture into the mushroom caps. Bake for approx 15-20 minutes or until mushrooms are tender and steamy after giving up a bit of their liquid. Dig in! Well, once the mushrooms are a little less molten hot than they will be straight out of the oven. Burning the roof of your mouth is the worst! You can totally prep the stuffing in advance to save time during the holidays! It'll keep in the fridge for up to 4 days. 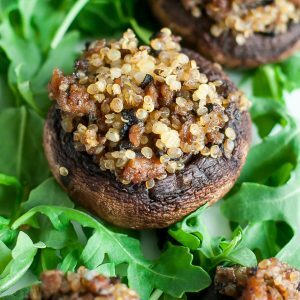 To save space I typically keep the stuffing in one container and the prepped mushrooms in another, then combine and bake when I'm ready for an impressive appetizer! They can also be pre-stuffed and popped in the fridge. With either option, take the ingredients out a little in advance to bring to room temperature before baking or simply add a few extra minutes to the total baking time if they're coming straight out of the fridge. Easy peasy! Feel free to use regular button mushrooms or baby bella portobellos! I've made it with both and they're delicious! I've also tested the recipe using both organic chicken sausage and pork sausage and it was divine both ways. Choose your favorite! No quinoa handy? These are also marvelous with Italian style or Panko breadcrumbs! Yum!